Thousands of protesters have marched through Macedonia’s capital and pelted paint-bombs at the main government building and police. They urged the government’s resignation, despite President Gjorge Ivanov recently ceding to opposition demands. More than 5,000 demonstrators led by opposition leader Zoran Zaev marched from the prosecutor’s office to the government headquarters in Skopje on Monday. The demonstrators deployed makeshift slingshots and fired paint-filled balloons at the government buildings and police officers. Although the demonstrators welcomed Gjorge Ivanov’s decision to rescind pardons for government officials caught in a recent wire-tapping scandal, they said it was not enough. They demanded his resignation and the full prosecution of those who were implicated. — Patrick Strickland (@P_Strickland_) 6 июня 2016 г. The demonstrators also demanded the release of protesters who had been detained earlier and a halt to all proceedings against them. Pictures on Twitter showed much of the ground covered in red paint to mark the death of 22-year-old Martin Neskoski, who was fatally beaten by police in 2011. Facing pressure from the opposition, the leader of the Republic of Macedonia Gjorge Ivanov on Monday rescinded pardons which had been handed to 34 figures allegedly involved in a wiretapping scandal in a bid to resolve the crisis. Last month he had called off his decision to pardon 22 other suspects. — Kamov (@georgekamov) 6 июня 2016 г. “In the past 10 days we have been witnesses of different interpretations of the decision to pardon ... therefore I have decided to annul the remaining decision for pardoning,” he said in a statement. — Цветко (@SkHornet) 6 июня 2016 г. 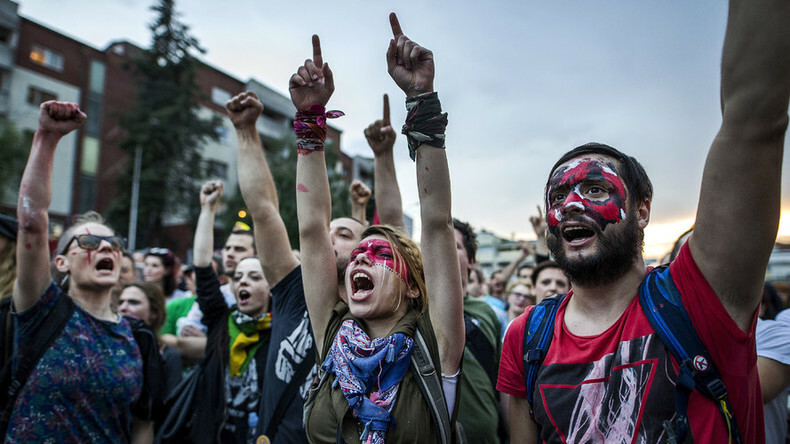 An EU-brokered deal required Macedonia’s government to hold early parliamentary elections, however, the unrest and opposition parties’ unwillingness to participate led to the postponement of parliamentary elections that were set for June 5.